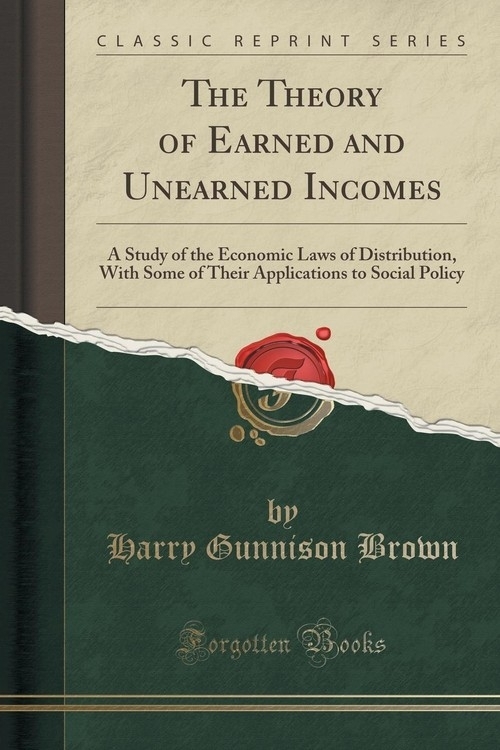 Excerpt from The Theory of Earned and Unearned Incomes: A Study of the Economic Laws of Distribution, With Some of Their Applications to Social Policy<br><br>The study here offered is intended to appeal to several classes of readers. My hope is that it will be read by, among others, socialists of the Marxian school, single taxers, and economists. For those orthodox or Marxian socialists who are willing to reexamine the theoretical foundations of their doctrines, interest will attach to the classification of incomes and to the attempt to distinguish between incomes which are earned and incomes which are unearned. The Marxian view that all income from property is "surplus value" and represents exploitation, is not accepted, but it is made clear that some income from property - as, indeed, from labor also - is unearned. To single taxers the discussion, in Chapter VI, of land rent and its taxation will perhaps be of chief interest, but the rest of the book leads up to and supplements the chapter on land rent in a way to make the whole study significant for this class of readers. I venture to hope, also, that professional economists, as such, will find enough of critical and constructive material in the text and footnotes, to make the study of interest to them. Finally, the book is intended to make an appeal to serious readers of no particular school or of any school of thought and of any business or profession, who are concerned with the evils in our present economic system and who look forward to worth-while changes during or after the war. World-wide democracy will be but half achieved if it be achieved in the political realm only, with no accompanying economic changes.<br><br>About the Publisher<br><br>Forgotten Books publishes hundreds of thousands of rare and classic books. Find more at www.forgottenbooks.com<br><br>This book is a reproduction of an important historical work. Forgotten Books uses state-of-the-art technology to digitally reconstruct the work, preserving the original format whilst repairing imperfections present in the aged copy. In rare cases, an imperfection in the original, such as a blemish or missing page, may be replicated in our edition. We do, however, repair the vast majority of imperfections successfully; any imperfections that remain are intentionally left to preserve the state of such historical works.